RBI’s monetary policy committee retained its GDP growth estimate for the current year at 7.4%, but lowered projections for next fiscal to 7.5%. Mumbai: The Reserve Bank of India (RBI) kept its policy rates unchanged on Wednesday, as was widely expected, and cut its inflation forecast for the rest of the financial year, citing a sharp fall in crude oil prices and food “deflation". The six-member monetary policy committee (MPC) voted unanimously to keep the policy rate unchanged at 6.5%. Barring Ravindra Dholakia, the MPC voted in favour of maintaining the earlier stance of “calibrated tightening". Dholakia, known for his dovish stance, voted to change the stance to neutral. Taking into account easing of food inflation, crude prices and an appreciating rupee, the MPC slashed its inflation projection to 2.7-3.2% from 3.9-4.5% for the second half of the current financial year. It expects inflation to quicken to 3.8-4.2% in the first half of the following year. “Given the assessment that growth will remain healthy for the rest of the year, the MPC retained its stance at calibrated tightening so as to buy time to pause, reflect and undertake future policy action with more robust inflation signals. 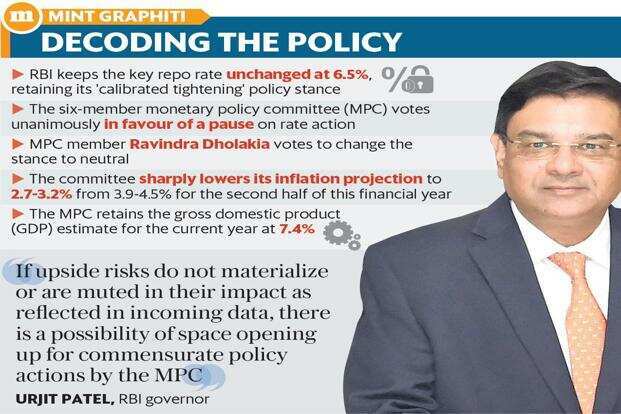 If upside risks do not materialize or are muted in their impact as reflected in incoming data, there is a possibility of space opening up for commensurate policy actions by the MPC," RBI governor Urijit Patel said. The bond markets, which interpreted this as a possibility of a future rate cut, saw the 10-year bond yield fall over 13 bps during trade. The 10-year government bond yield closed at 7.441%, a level last seen on 13 April, from its previous close of 7.573%. While the MPC reduced the inflation forecast, it retained the gross domestic product (GDP) estimate for the current year at 7.4% with “risks somewhat to the downside", possibly to account for the credit squeeze and demand weakness. RBI’s new liquidity management framework incorporates an SLR reduction by 25 bps every quarter until the SLR reaches 18% of net demand and time liabilities (NDTL). While this reduction is unlikely to have a material impact on domestic liquidity, it is part of the road-map to align SLR with 100% liquidity coverage ratio (LCR). LCR is the amount of high-quality liquid assets that banks have to set aside to meet short-term obligations. “The RBI decision to keep rates on hold was more in consonance with market expectations but the policy guidance was a pleasant and pragmatic surprise. The significant downward revision in inflation projections and assurance of continued durable liquidity was most reassuring to market participants in terms of a stable and predictable interest rate structure," said Rajnish Kumar, chairman, State Bank of India. Governor Patel also ruled out any possibility of a cut in cash reserve ratio (CRR) to enhance liquidity. CRR is the amount of funds that banks have to keep with the central bank as a proportion of their deposits. Instead, RBI assured that it will continue with increased government bond purchases through open market operations (OMO) to provide liquidity till March-end. The central bank has already done OMOs worth ₹ 1.36 trillion in this financial year and has announced a further tranche of ₹ 40,000 crore. Wednesday’s policy status quo, combined with the continuing stance of “calibrated tightening", is unlikely to see an immediate impact on interest rates for consumers. However, the central bank’s decision to ask banks to price all floating rate loans to an external benchmark from 1 April could ensure better policy transmission. The Reserve Bank of India (RBI) said on Wednesday that borrowers with working capital limit of ₹ 150 crore and above will need to have at least 40% of it in working capital loans. “In respect of borrowers having aggregate fund based working capital limit of ₹ 150 crore and above from the banking system, a minimum level of ‘loan component’ of 40% shall be effective from April 1, 2019," RBI said, adding that the component will increase to 60% from 1 July.